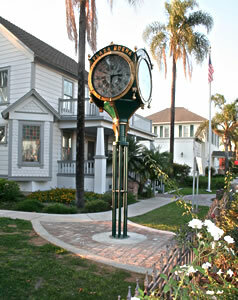 The Dreger Clock was installed and completed on Friday, September 25, 2009! Sign up to receive news updates on the Dreger Clock restoration project. as "that big clock with all the dials at Knott's Berry Farm". But I remember it as my great-grandfather's legacy. 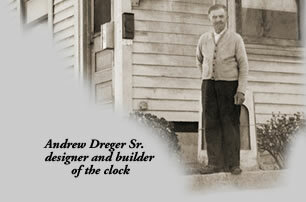 The "Dreger Clock" was built by my great-grandfather Andrew Dreger Sr., an early pioneer of the Long Beach, Buena Park and Anaheim area. He was a watchmaker in his later years and built this amazing clock for the enjoyment of his community. After His death the clock made its way to Knott's Berry Farm where it was enjoyed by thousands of visitors to Buena Park for over 50 years. But in the past year, you may not have noticed that it was missing from its home in front of the ticket booths. It fell into disrepair and was removed, hidden from the public in a warehouse. The Buena Park Historical Society wants to return it to the public view. We want to put it back in front of the eyes of the community! The clock has been purchased and awaits restoration cleaning and a new home. Our dream is to see the clock restored, running and being enjoyed by visitors to the City again. 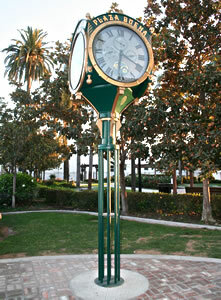 We hope to place it along Beach Blvd in the city's historical park, across from the Buena Park City Hall. But, we need the community's help to bring this symbol of Buena Park and Orange County back so the public can once again enjoy it. I hope you enjoy learning about the clock at this website and consider donating toward its restoration costs or helping in other ways. 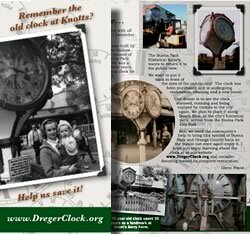 Dreger Clock brochure and donation slip. The Dreger Clock website design and maintenance donated at no expense by Pixeldigits Web Design / Glenn Frank.